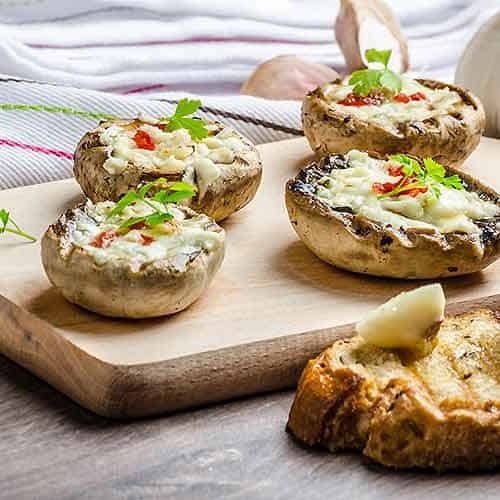 Great as a starter or for lunch, this feta, mushroom and joywala dish is vegetarian and a delight that delivers a tingle of heat and plenty of flavour. Combine the oil with the garlic and spring onion, heat over a hot flame in a frying pan briefly to allow the oil to become flavoured with the garlic and onion. Once cooled add the sherry vinegar, salt, pepper, paneer cheese. Stir well to combine and give it a few minutes to allow the paneer to soak up the flavours. Pre-heat the grill and place the rack on the middle shelf of the oven. Paste half a tablespoon of the India Joywala or Lucknow Mango Chutney into each of the upturned mushrooms. If you want spicy use the India Joywala, for the milder version use the Lucknow Mango Chutney. Next spoon in the feta cheese mixture and divide between all of the mushrooms. Grill for approximately 10 Minutes, this'll depend on the size of the mushroom and depth of the filling.